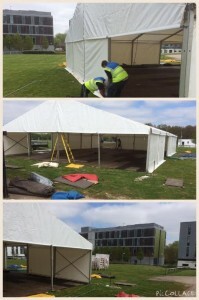 Last week at BSW Marquees we installed a large frame marquee at the Anglia Ruskin University in Chelmsford, Essex. The University were hosting a seated dinner awards evening for up to 200 guests. We supplied a stage, flooring, heating, tables and chairs. The whole set-up took a couple of days. At BSW Marquees we specialise in marquees not only for weddings and parties but marquees and frame tents for large events. For a number of years we have provided tents for Essex Young Farmers, the V Festival at Hylands Park and Chelmsford City Council as well as regular corporate hospitality for a range of regional businesses. We also provide tents and other equipment for dozens of fetes and summer fayres in the Essex, Suffolk, Hertfordshire and Cambridge. All our marquees and frame tents are supplied fully insured, all our workers are experienced and courteous. If you are looking for a marquee for your business or event contact me now. I can give you an idea of cost and availability over the phone or by email.